Many headaches are caused by musculoskeletal tension in the neck and upper back, this accounts for up to 70% of headaches. Possible causes of tension headaches include poor posture, stress, and muscular fatigue through repetitive strain. 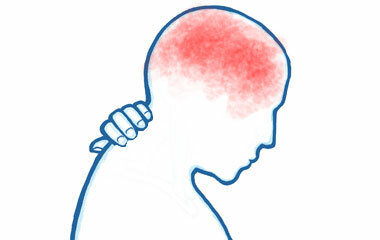 Headaches of this type are called cervicogenic headaches because the origin is from the neck (or cervical spine). These headaches typically feel like a dull squeezing pressure or aching on both or one side of your head. 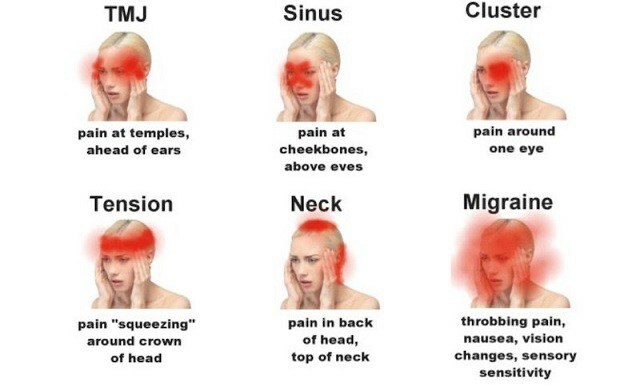 These are typically tension or neck related as seen below amongst other classifications of headache. Osteopathy can help successfully with cervicogenic headaches by increasing your feeling of relaxation assuming they are initiated by stress. We can diagnose and treat poor posture or help correct imbalances in your anatomy. This should vastly reduce the number of headaches that you experience. Although unlikely it is also important to remember that headaches can sometimes be indicative of more serious issues if they are combined with other signs such as a high fever, pain following a head injury, loss of vision and numbness or muscle weakness in the hands of feet. 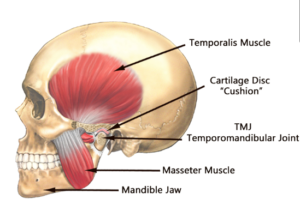 Other classifications of headache can be related to other structures such as the tempero-mandibular joint (or TMJ) which attaches your mandible to your to your temporal bone (which is part of your cranium). Pain from the TMJ would also normally be associated with jaw movements such as chewing or yawning although pain would also obviously refer to the temporal region where the joint is situated. Chronic sinusitis is a common condition in which the cavities around nasal passages (sinuses) become inflamed and swollen. This condition interferes with drainage and causes mucus buildup. The area around your eyes and face might feel swollen, and you might have facial pain or tenderness. Cluster headache are typically characterised by unilateral (one sided) pain, although this can alternate. The pain is usually centred over one eye and this can spread variously to a larger area making diagnosis harder. During a bout of cluster headache the pain is often experienced at a similar time each day. Pain usually reaches its full intensity within 5 to 10 minutes and lasts at this agonising level for between 30 and 60 minutes. For some people the pain can last for 15 minutes, for others 3 hours has been known. It then stops, usually fairly abruptly. In about 80% of people with cluster headache the bouts (or “clusters”) of head pain last for 4 to 12 weeks once a year often at the same time and often in the Spring or Autumn. The remaining 20% of people do not have these pain free intervals and are said to have “chronic cluster headache.” The reasons for cluster headaches remains unclear. Migraines have a very different nature to normal headaches. 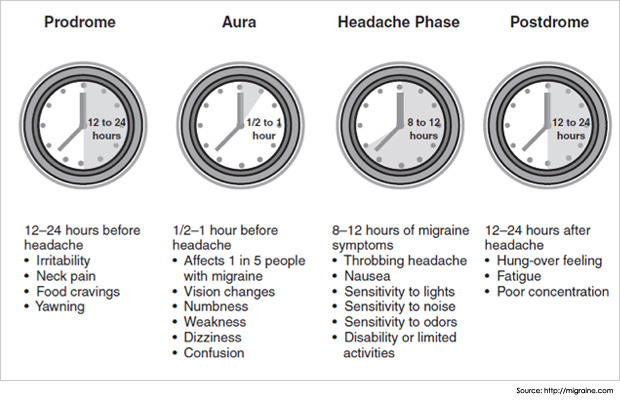 The classic migraine, or migraine with aura, is characterized by being allied with sensory disturbances. These can occur with nausea or sensitivity to sound or smell. 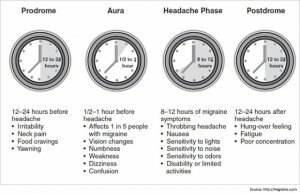 The migraine without aura, as the name suggests, does not comprise any sensory symptoms. The stages of migraine are as follows. 1Prodrome symptoms. A few hours before a migraine you may feel tired and uneasy. Your sense of taste and smell may be affected. 2Aura. Up to 1 hour before the headache starts, you may experience flashing lights, black spots or other visual problems.